FNUPress ReleasesLatest News Students Coming Together For A Great Cause! 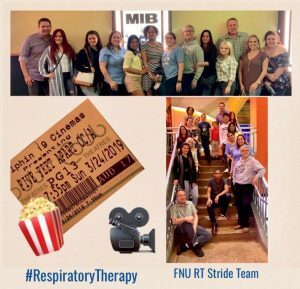 Florida National University’s (FNU) Respiratory Therapy students and alumni join forces to raise awareness and money for the Cystic Fibrosis Foundation! The Respiratory Therapy (RT) students were motivated after listening to a very informative and educational presentation by Mrs. Karen Alba, VP & General Manager of JKARE. Mrs. Alba spoke about issues within the profession, and shared information about the Cystic Fibrosis Foundation. The students unanimously decided to form a team to participate in the Miami 2019 Great Strides Walk supporting the Cystic Fibrosis Foundation, and voted on a team leader. 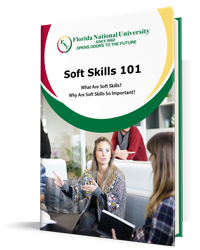 Following the presentation, refreshments and light snacks were served; students and guest speaker were joined by FNU’s President/CEO, Dr. Maria Cristina Regueiro, who promised to match 100% of the funds raised by the students for this cause. The students enthusiastically created the FNU RT Stride Team, and immediately started getting donations! Recently, a group of the Respiratory Therapy students, Mr. Jose “Tony” Lammoglia, Respiratory Therapy Program Director, Dr. Loreto Almonte, Allied Health Division Head, two Faculty members Mr. Rafael Fernandez, and Ms. Yamila Ferrufino, and National Respiratory Therapy Honor Society’s Lifetime Member Bibi Borges, accompanied by some family members, met at a movie theatre to watch “Five Feet Apart.” A very moving and inspirational story about a young couple with Cystic Fibrosis who fall in love while hospitalized. This walk will take place on Sunday, April 28, 2019 at Virginia Key Beach, Key Biscayne, Florida at 9:00 a.m.